This is a real blast from the past. 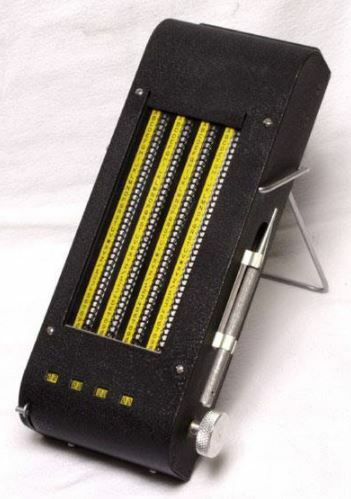 Who can tell me what this was called and what it was used for and even the process of how it was used.. Good question for the younger Communicators amongst you. Thanks Frank L for the image. The PENELOPE cryptosystem was designed for the encryption of call signs and address groups used on radio circuits, both CW and Voice. System components included keying materials and two associated devices designed for encrypting call signs and address groups in the form of four character groups, which were composed of any combination of letters and digits. Encryption produced another four character group, consisting in this case of any combination of letters, digits and slant V signs. The call signs and address groups which could be encrypted by the system could be found in separate publications. (a) A substitution table for changing plain four character address groups or call signs into intermediate groups, which could be further encrypted. (b) Key cards for use with one of the cryptodevices in encrypting and decrypting the intermediate groups obtained through the substitution table. INTERMEDIATE GROUPS WERE NEVER TO BE TRANSMITTED WITHOUT FIRST BEING ENCRYPTED. Substitution squares and key cards, being complementary, were together known as PENELOPE Key Lists. (a) CSP 1750 (KA-2) A manually operated mechanical device, used in conjunction with key cards to encrypt and decrypt intermediate groups. (b) CSP 1756 (KA-3) – A device which used sliding strips, for the same purpose as the CSP 1750 (KA-2), and intended for use whenever the CSP 1750 (KA-2) was inoperable. This was included with the appropriate PENELOPE keying material. A procedure known as MISFIT was devised for retarding voice call sign changes when a force was engaged in action at a time scheduled for a call sign change. Implementation of MISFIT Procedure merely continued the use of voice call signs already in effect past the time scheduled for their supersession; it had no effect on the supersession of RATT/CW call signs. Thus, when MISFIT was declared and the time scheduled for normal call sign change was reached, AMSP 298 key card supersession took place, new call signs (CW/RATT and voice) were derived, and all but the newly derived voice call signs were put in use. As long as MISFIT was in effect, the voice call signs already in use, derived by means of the superseded key card, remained in effect. CHARTER – When the situation requiring retardation of the voice call signs change had passed, replacement of the superseded voice call sign was effected as soon as possible. The OTC may have accomplished this by ordering transmission to units concerned by the use of the term “CHARTER”, followed by the designation of the effective AMSP 298 key card by which the new voice call signs would be derived, and a time indicating when that key card was to be put in use. As transmitted, this order meant “Change to call signs encrypted by means of AMSP 298 daily-changing key card “DZ” at O8OOZ”. The OTC ensured simultaneous promulgation of MISFIT procedure on all voice radio circuits under his control. Ordering MISFIT procedure into effect in the manner described above before engagement in action had occurred could betray to opposing forces that an operation is impending. Therefore, any orders issued prior to engagement in action which indicate that MISFIT procedure is to be implemented will be afforded physical or cryptographic security in their transmission. csp_1750_a_687_2.jpg The CSP 1750 (KA-2) was a manually operated cipher device which was employed in enciphering and deciphering four character groups for which intermediate groups have been substituted. The cipher device is of metal construction. On its surface are four columns of characters with a movable chain beside each column. Below the four columns of characters are four windows in which appear the counter numbers for each column. A metal stylus is attached in brackets on the side of the device for use in moving the chains. Where’s the keying material Frank L? The Penelope cryptosystem for callsign encryption. Model CSP 1750 (KA-2).